A busload of Randolph Union High School students had the opportunity to walk in the shoes of a U.S. senator for a day, last week, during Vermont Day at the The Edward M. Kennedy Institute for the United States Senate in Boston. Along with peers from three other Vermont high schools, the students started the day with a video conference call with Sen. Bernie Sanders, broadcast in the institute’s full-scale replica of the U.S. Senate chamber. Later in the day, students participated in the institute’s nationally recognized, Senate immersion module program, during which they debated the merits of amendments to the Agricultural Act of 2014, better known as the Farm Bill. Before heading back home, the students passed the legislation by a vote of 67-15. RUHS junior Joseph Dingledine said the immersion module started with each student being assigned “a personality” and party affiliation. Dingledine was a Republican senator from Alabama, for example; senior Brandon Ryan was a Democratic senator from Minnesota. All “senators” were provided information on their respective states’ and parties’ priorities. Emily Therrien, who teaches AP U.S. History at RUHS, explained that students were required to advocate for or against proposed amendments to the Farm Bill. They attended a series of meetings throughout the 2.5-hour simulation— first with their respective committees, then in party caucuses, and finally gathered on the floor, to vote on the bill. The trickiest part, he added, was when the priorities of his state and party were at odds. Ryan, who is in Therrien’s AP class, said he found this “crisscrossing” between state and party priorities a useful exercise in exploring the “gray areas” in issues. “I was surprised at how many compromises we had to make,” commented RUHS student John Blaisdell. “Because I was playing a Republican senator, a lot of our amendments proposed were totally opposite of what the Democratic senators were wanting,” he said. Not all of the RUHS students on last week’s trip were U.S history students. Teacher and drama director Brian Rainville accompanied several students who had been part of a student production of a play about the Kennedy family last year. ‘Black Lives Matter’ Flag Raised at H.S. 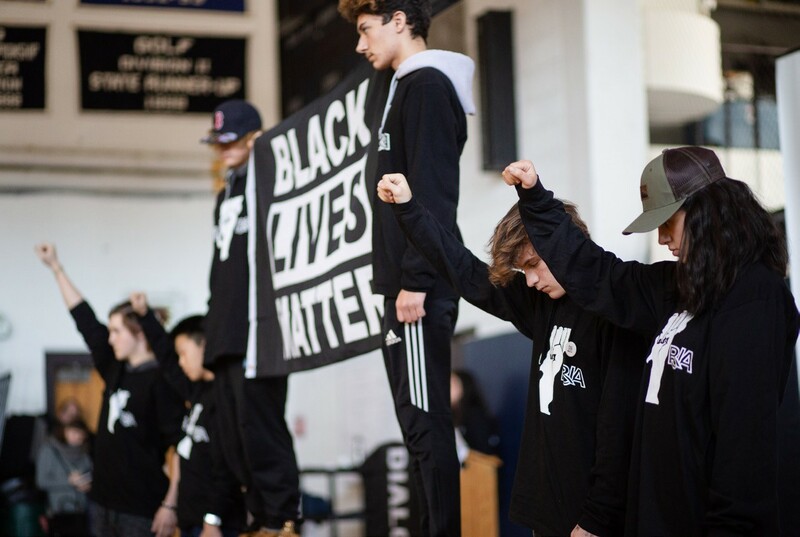 A group of Randolph Union High School students known as the Racial Justice Alliance proudly displayed the Black Lives Matter flag in front of the entire student body as part of the Martin Luther King Jr. Day assembly. The alliance, which formed as part of a project based learning initiative at the high school, sent a proposal to administrators on January 4, asking to raise the flag. On January 10 Principal Elijah Hawkes and Associate Principal Caty Sutton approved the students’ proposal to fly the flag in front of the high school. During the assembly Hawkes noted that he had twice before denied requests to hang the flag at the school, because he believed more communication with the full school community about the flag was necessary before making a decision. In the written proposal, students in the racial justice alliance outlined the history of the Black Lives Matter movement, the name of which began as a hashtag on Twitter after the death of high school student Trayvon Martin, unarmed 17-year-old African- American who was shot and killed by George Zimmerman, a white neighborhood watchman in 2012. The idea of raising the Black Lives Matter flag at the high school was first brought up last year, when Booska mentioned the idea in front of the school community. At the time, Hawkes denied the proposal, asking for more students to be involved in the decision. Booska said he had challenged administrators and students to raise the flag for the beginning of the school year. Booska noted that Montpelier High School was the first public school in the nation to fly the Black Lives Matter flag, and RUHS is now among only a handful of schools that have opted to fly the flag, as well. Ryan explained that even though raising the flag is not intended as a threat to white people, it can sometimes be interpreted as such. Booska and Grandy explained that earlier in the school year the racial justice alliance distributed an optional survey to the student body asking whether students were familiar with the Black Lives Matter movement, its history, and whether the students wanted to see a Black Lives Matter flag raised at the school. Booska estimated that the alliance received more than 170 responses. Overall, he explained, most of the comments reflected that many students knew little about the Black Lives Matter movement, but were interested in learning more. Grandy explained that after compiling the results of the survey, the group decided to visit each grade and share information about the movement’s history, and why the alliance felt raising the flag was an important action to take. Noting that for the most part the students, staff, and faculty have seemed overwhelmingly supportive of the racial justice alliance efforts, Grandy hopes that support will turn into more action. Wood said going forward he hopes the community will continue to discuss issues of racism with people who have different perspectives on the issue. “When we talk about it, when we have civil discussions, we can really get something done,” said Wood. RU’s Director of Career Pathways and Workforce Development, Ken Cadow, was recognized in a surprise and well-attended award ceremony this week by his peers and members of the Vermont Business Roundtable. In presenting Ken with the 2018 New Medallion Award, Roundtable President Lisa Ventriss noted his many outstanding – and creative – efforts towards helping students understand and pursue areas of work and study that are of interest to them and important to the State. Ventriss was joined at the podium by Roundtable colleagues Sherra Bourget, Patrick Leduc, and Chris Loso. The Vermont Business Roundtable is a statewide organization of chief executive officers representing a diversity of economic sectors and geographic regions. The Roundtable is committed to sustaining a sound economy and preserving Vermont’s unique quality of life by studying and making recommendations on state wide public policy issues. You can visit their website at www.vtroundtable.org. On Wednesday, Dec. 19, seven Randolph Union High School students, plus teacher Scott Sorrell and the school’s director of project-based learning, Lisa Floyd, traveled to the Veterans’ Place in Northfield, to deliver items that Sorrell’s Project Based Learning Challenge (Interact) had collected. Items included clothing, food, toiletries and other necessities. According to Floyd, the Veterans’ Place is approaching its 10th anniversary, and has helped more than 350 homeless vets get back on their feet after serving their country. The site offers not only a place to call home, but also food, support navigating all of the paperwork that people need to deal with in order to receive benefits, and most importantly, companionship. Veterans’ Place Director Karen Boyce told students she tries to prepare the veterans for the gifts of gratitude that will pour in over the holidays, but it is hard for them to imagine until they are there. She took the students on a tour of the home. Students asked about whether the home offers services to female veterans. The answer was no, since there is not as much need, and because regulations about how the site would have to operate would be costly to implement. For the last few years, former Interact student Kayla Ball, now a freshman at Northern Vermont University, Johnson campus, began collecting goods for the Veterans’ Place. This year, Rachel Davis, a Randolph Union senior, picked up where Ball left off, and doubled the amount of goods donated. “We did this to address food insecurity in the local community, but also to raise awareness about need,” said Finley, who emphasized that the program is funded entirely by donation. In total, FFT put together 25 bags of food and toiletries, which the Interact students presented to the Veterans’ Place. Seventeen-year-old Salma Asleh of Arraba, Israel is one of the new faces among RUHS’ class of 2019. A recipient of the prestigious State Department-sponsored Kennedy- Lugar Youth Exchange & Study (YES) scholarship, Asleh said she has arrived to Randolph “very open to the full picture.” The YES program facilitates cross-cultural high school exchanges between the United States and a host of countries with significant Muslim populations. Unlike in the U.S., lunch is the main meal of the day and the occasional family barbecue is a cause of much excitement, she said. Family, overall, is a key component of Asleh’s culture and in her free time she is often with her parents and siblings. The youngest of four siblings, Asleh stands out in not wanting to pursue a career in the sciences—her sister and brother are physicians, and her other sister is studying electrical engineering in Tel Aviv. Despite being enrolled, like most of her schoolmates, in primarily science and math courses in Arraba, the soft-spoken young woman’s eyes light up when she talks about her passion, the violin, and her goal to enter a conservatory in Europe. While she is in Vermont, Asleh takes weekly lessons in Montpelier under a Montreal-based violinist. Her international learning experiences, however, go way back—several years ago she and a few peers traveled to Bangkok, Thailand to participate in the World Scholar’s Cup. Back home, the teenager enjoys her own area’s rich cultural history, her family’s picnics in the countryside, and visits to Jerusalem, a two-hour drive away, to visit historic sites and to pray at the mosque. Although her town is predominantly Muslim, Asleh explained that intermarriages between Muslim and Jewish people are not totally uncommon. While Israeli-Palestinian affairs are rife with violence, in the northern part of Israel, where Asleh is from, she said she has experienced very little of the pressure and political tension felt more strongly in Gaza and the West Bank. “I kind of feel bad to say it,” she said, “but I’m kind of lucky where I live, because it’s not the main focus of conflicts. Here in the U.S., the observant exchange student has had the opportunity to learn more about her own culture in addition to this one, she said. Roadtrips to Rochester, N.Y., and to Pennsylvania have seen Asleh engage in many thought-provoking conversations with her host mother, Melissa Scalera, she said. Often, the former will have to turn to the World Wide Web in order to clarify a point about Palestinian history or politics. One of her main goals for her time in Randolph is to develop more self-confidence and to form lasting relationships. Asleh is well on her way to both. Ten students from the port city of Cuxhaven, located in the Lower Saxony region of Germany at the edge of the North Sea, will be spending the next ten days exploring Vermont, attending classes at RUHS and RTCC, and renewing ties with friends in the Randolph area. The exchange, initiated by Vermont Technical College over a decae ago, has become an annual tradition with students from both countries taking turns visiting each other’s schools and learning about the educational and career opportunities both provide. When VTC eliminated the program in 2012, RUHS saw it as a chance not only to continue a longstanding relationship, but also as an opportunity to broaden its students’ knowledge of and interest in European cultures. According to their chaperones, the German students are also very excited to be able to spend time in Boston and New York City on either end of their trip. A closing pot luck dinner and ceremony will be held on Tuesday evening, October 2 at the Brookfield Town Hall (by the floating bridge) at 6:45 pm. Former host students and families are welcome and encouraged to come. First RU Summer Institute Success! From July 9th through 20th, twelve 7th and 8th graders participated in the first RU Summer Institute, organized by RU 7th grade science teacher, Kerry Hazard and led with support from Media Specialist Michelle Holder and Cathy Ingalls. Generously funded by a grant from the State of Vermont, the sessions took place during two sunny weeks in which students normally are on vacation. “The academic work focused on literacy, math and science as it related to the environment and projects in the community,” Hazard said. According to Hazard, she’d like to see the institute become an annual event, and possible expand it down to the 6th grade. In the meantime, by all accounts RU’s first Summer Institute was a huge success.